I was able to return to a walking/exercise routine yesterday. Nearly three weeks of "No, you are too weak right now," from Dr. Polo was too much "rest". I feel much better. The photograph above was taken on the 16 de Septiembre (street) leg of my walking route. 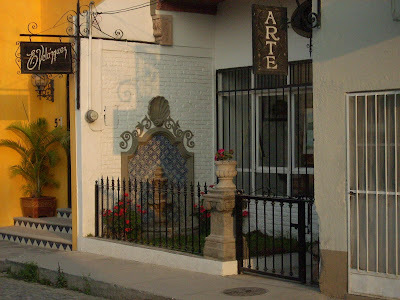 I really do like the use of paint, tile, and plants in Ajijic to decorate homes and businesses. I live in a very colorful town. And, still, every day the beauty of this place leaves me awestruck.